NASA’s Hubble Space Telescope recently completed one of its most thorough and ambitious mozaic projectes. 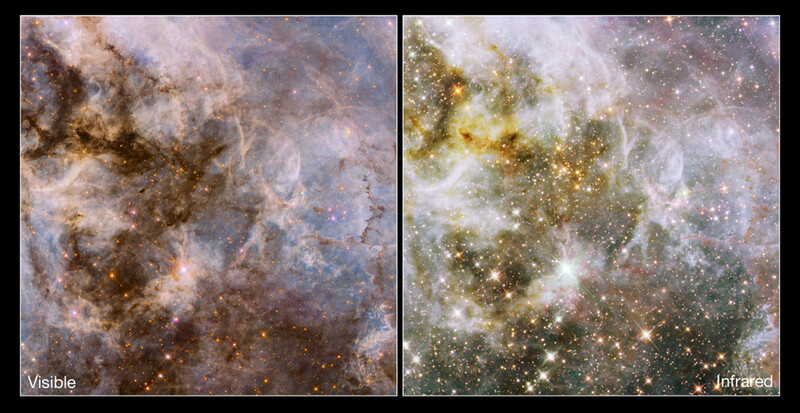 Astronomers at Hubble, stitched together some 438 separate images, both in visible and infra-red light, to complete the most accurate picture of the Tarantula Nebula so far, spanning across no less than 600 light-years. The Tarantula nebula contains some 800,000 newly born or developing stars, and these latest developments will hopefully help scientists answer some puzzling questions on star formation. One such question is whether super-massive stars – stars with mass at least 50 times greater than the sun – form exclusively in star clusters or not. The Tarantula Nebula, located 170,000 light-years away in the Large Magellanic Cloud, contains the nearest observable super-cluster of stars. Coupled with the fact the nebula is still a massive star hatchery, makes it an ideal candidate for investigating super-massive star formation in isolation. Hubble is sensitive enough to resolve individual stars and many red protostars as well as aging red giants and supergiants, giving astronomers new insights into the stars’ birth and evolution. The telescope had to be wired to ‘see’ in infra-red however, since only these light wavelengths can peer through the ubiquitous clouds of dust and gas which are aggregated in star formation. “Because of the mosaic’s exquisite detail and sheer breadth, we can follow how episodes of star birth migrate across the region in space and time,” said Elena Sabbi, an astronomer at the Space Telescope Science Institute in Baltimore, Md., and the principal investigator of the observing team. So far, astronomers have identified a multitude of star formation pockets, which most likely will merge into large clusters. When the program will be completed, astronomers will have a more refined view of various star formation properties.